The most anticipated bike of the Year 2016, Royal Enfield Himalayan is all set to make its debut in Indian two-wheeler market on March 16. Freshly developed engine, manageable ergonomics and new styling sit as the crux of the product. This 400cc adventure sport was recently revealed by the company. So if you are interested in buying one or you want to have a preview of the bike before making any purchase decision, you could hit to the nearby showroom, click on the video link provided below to watch the bike in action. It has a powerful 411cc, air-cooled, 4 stroke, single cylinder engine that is capable of producing a maximum power of 24.5 bhp at 6,500 rpm, along with notable 32Nm of torque between 4,000 rpm – 4,500 rpm, which means the rider will not have to hit its rev-limiter to extract its full potential but instead he could enjoy its riding at mid range that not only offers less stress on its engine but it is lighter on your pockets too. Its engine is mated to 5 speed constant mesh transmission and its fuel supply is done by carburettor with throttle position sensor. It measures 840mm in width, 2190mm of length and a seat height of 800mm. But it is its 220mm ground clearance that makes it an apt product for off-roading. Powering its brake is a 300mm disc at front and at rear it has 240mm disk brake which offers stable declaration to riders. 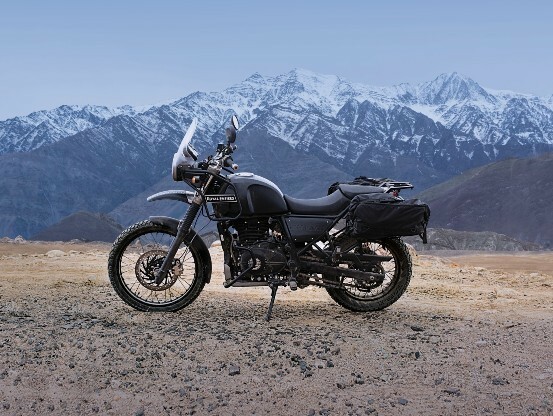 The expected price tag of the Himalayan is around INR 2,00,000.